Former Austinites Mamalarky have something interesting brewing here with their new track “Hero.” Opening up the package, you’re tricked into this angular psych rocker, quickly fading into twinkling keyboard notes and the dreamy vocals of Livvy Bennett. I was sold on that formula alone, but they add another turn into the song’s map, switching into full-on pop bravado with a churning chorus that’s built to spin you around; it has the sunshine one would expect from a move to Los Angeles. 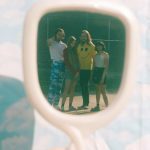 If vibrant psychedelic pop music is your thing, then look no further…the band will also appear at this year’s SXSW so add them to your list.